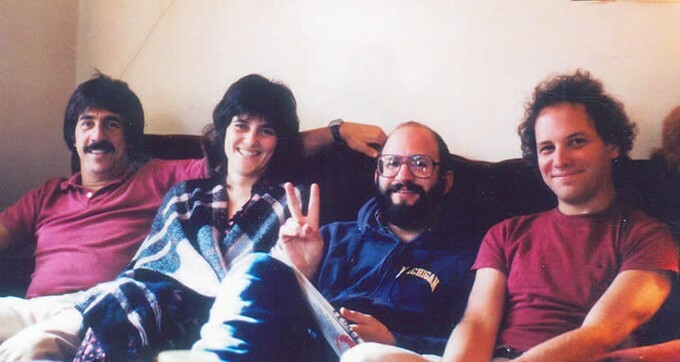 NPP founders in 1983 (L-R): Greg Speeter, Brenda Loew, Ricky Fogel, Alwin Schmidt. NPP is excited to announce a new chapter: a partnership with the Washington DC-based Institute for Policy Studies. This new partnership will ensure that NPP continues its long history of groundbreaking work for a federal budget that ensures peace, prosperity and security for all. As of October 1, National Priorities Project (NPP) will join the Institute for Policy Studies (IPS). The NPP and IPS boards of directors have voted unanimously to approve this partnership, effective October 1, 2017. NPP will become a project of IPS. With our base remaining in Northampton, Massachusetts, and with a strong culture of autonomy among IPS projects, NPP's program staff will continue the same hard-hitting work you have come to expect, bringing you details of the federal budget to make sure our federal resources prioritize peace, shared prosperity, and economic security for all. We will continue to rely on your support. More than half of our support comes from individuals like you, while the rest comes from a number of dedicated foundation supporters including the Colombe Foundation, Stewart R. Mott Foundation, and others. In the future, your dedicated gifts to NPP will continue to support our work. We are in a moment of challenge and opportunity – challenging for reasons ranging from the political and geopolitical, to new media frontiers, to realities of funding. At the same time, there is a new recognition across movements of how interconnected our issues are: from climate change to peace and security to racial justice, joining forces makes us stronger. Joining IPS will result in a stronger NPP, with deeper ties to grassroots movements and new audiences for our work. Through this partnership, we will grow our list of supporters nationally, drawing upon the strengths of the IPS organization. And the newly expanded capacity in communications, development and administration that IPS will provide means more people and resources to help us focus on the work you care about. As we implement this transition, I will phase out of my work with NPP. On August 15th, I begin work with an international foundation. I am grateful to take with me a newly profound appreciation for the power of our combined resources, and for the power of our own voices, and to have been a part of the truly one of a kind community of people who share our values. I cannot emphasize enough the dedication and commitment to quality work of NPP staff. I leave NPP in capable hands. Lindsay Koshgarian will step into the leadership position of Program Director. Lindsay has been NPP's Research Director since 2014 and will carry the legacy of NPP's core programmatic direction, providing strategic vision and day-to-day oversight for NPP's work. Abby Rusk will continue to orchestrate NPP's celebrated digital communications. Both Lindsay and Abby will remain in Western Massachusetts. NPP's Board Chair, Heidi Garrett-Peltier, will also join the board of IPS to ensure continuity of vision and execution at the highest level. IPS' Executive Director John Cavanagh will bring his years of expertise in organizational leadership and movements for change to lead NPP and our movement-building work forward. A leader in the peace and security movement, John recognizes the value NPP brings to IPS' portfolio of expertise, lending greater capacity and influence to their work, especially around military spending. We couldn't be happier about the ability to leverage our work and find synergies with existing IPS programs, which include work on global economies, climate policy, inequality, peace and diplomacy, and more. We also want to invite you to learn more about the Institute for Policy Studies. Founded in 1963 by two former Kennedy administration staffers, IPS quickly found its place in the anti-Vietnam war and civil rights movements. Today, IPS is unique among DC think tanks for its dedication to building a more equitable, ecologically sustainable, and peaceful society, in partnership with dynamic social movements. But the history between IPS and NPP goes deeper than natural affinities and shared values. IPS Executive Director John Cavanagh, among other IPS leaders like Phyllis Bennis and Chuck Collins, shared long friendships with NPP founder Greg Speeter and walked side by side in their dedication to a more peaceful, equitable world. That spirit and shared goodwill continues to this day. Stay tuned for more information on the transition to a more powerful NPP! In the meantime, please continue to support this vital work – we can't do it without you.